Damani Phillips, University of Iowa associate professor of jazz studies and African American studies, playing the saxophone. Phillips created “Jazz in the Fight for Civil Rights” for a Martin Luther King Jr. campus event five years ago. Since then, it has toured Iowa and the world. Photo by Tim Schoon. What started as a one-time performance celebrating Martin Luther King Jr. Day on the University of Iowa campus five years ago has evolved and spread across the state of Iowa. As the UI prepared for the campus’ 2014 MLK Celebration of Human Rights, Damani Phillips was asked to make a musical contribution to a program that would also feature spoken commentary, theater, dance, and recitation of King’s speeches. The UI associate professor of jazz studies and African American studies decided to focus on how jazz interacted with the civil rights movement. The performance was a success, and Phillips thought that was that. However, people in the audience began to contact Phillips about bringing the musical performance to their communities. Phillips reworked his portion of the program to make it a standalone presentation, calling it Jazz in the Fight for Civil Rights, a combination of live performance, spoken remarks, and visual presentation. He and the other members of the quartet—at that time a fellow faculty member and two graduate students—began traveling across Iowa. Rich Medd, band director at West High School in Iowa City, Iowa, has performed in several groups with Phillips over the years and asked Phillips’s quartet to perform as part of the school’s 2018 Martin Luther King Jr. Day programming. Over time, Phillips created a sister program, Black Music in the Fight for Civil Rights, that expanded on jazz to include examples of soul, funk, and R&B protest music. However, Phillips was limited to music that could be performed with his traveling quartet. 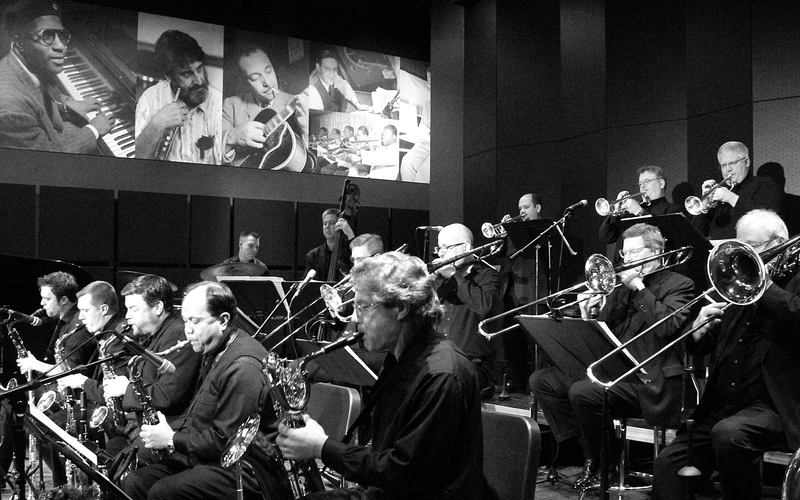 Then in October 2017, the Turner Center Jazz Orchestra, a resident professional ensemble of the Turner Jazz Center at Drake University in Des Moines, Iowa, approached Phillips about creating a version of the program that included notable big band composers. The Turner Center Jazz Orchestra performing part of Jazz in the Fight for Civil Rights. Photo by Kelly Sargent of Brainstorm Marketing Iowa. Paul Bridson, president and lead trombonist of the Turner Center Jazz Orchestra, says the program addresses a common problem in many Iowa communities. Bridson says tickets to the March 2018 show were selling so fast that the organization quickly added a second performance, which also sold out. The two performances broke organization attendance records. Phillips says that audience members, no matter which of the three iterations of the program they see, often comment that they didn’t realize the cultural influence these types of music had on the country. Bringing that fact to light was one of Phillips’s goals. 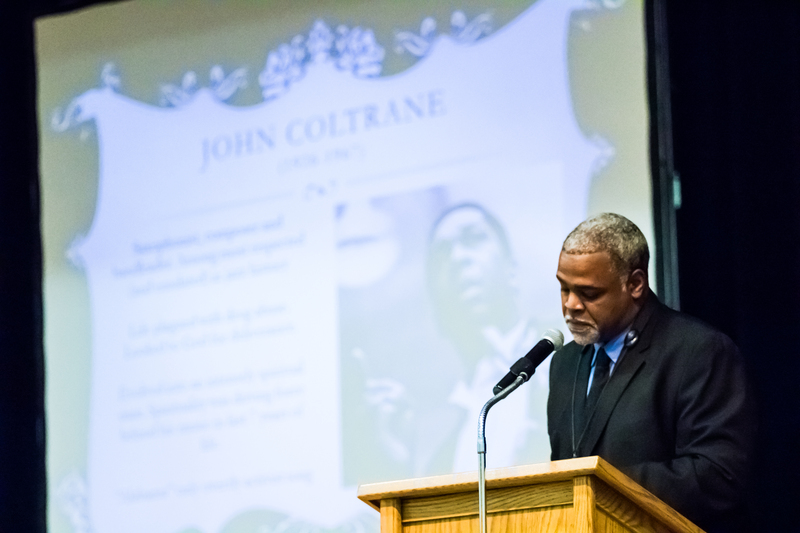 Damani Phillips discusses John Coltrane. Photo courtesy of Iowa Lakes Community College. Even as a professor of jazz and African American studies, Phillips says he had to hit the books to develop these programs. While this research was done specifically for the Jazz in Fight the Civil Rights project, what Phillips has learned also has found its way into the courses he teaches at the UI, particularly those dealing with black music. Phillips says the reaction to the programs has been overwhelmingly positive, especially in schools. 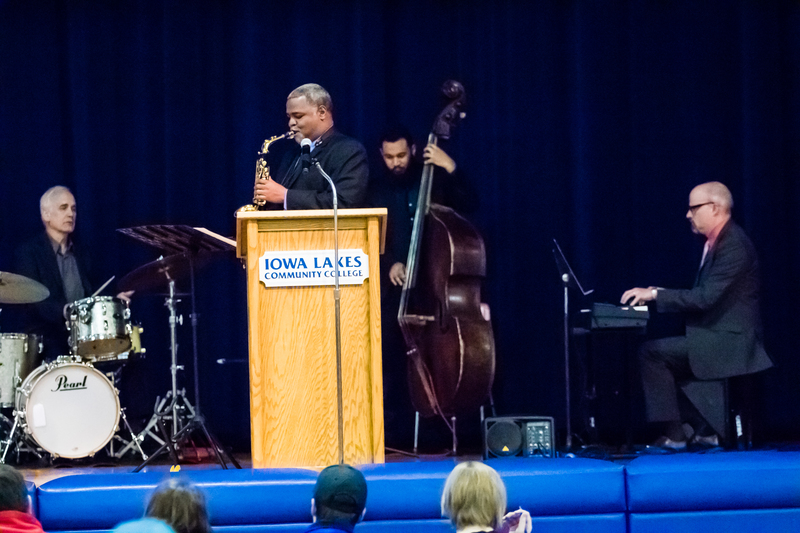 The quartet playing at Iowa Lakes Community College. Photo courtesy of Iowa Lakes Community College. Medd says he was impressed with the number of West High students who chose to attend one of the day’s two Jazz in the Fight for Civil Rights presentations. Feedback showed it was one of the highest-rated presentations of the day. Bridson says people are still talking about the March 2018 shows at the Turner Jazz Center. While people tend to leave the program feeling enriched and uplifted, Phillips says it can also be uncomfortable at times. After a performance in February 2019 on the UI campus, Phillips says he plans to continue taking the show on the road a few times a year.